The automaker and materials producer both posted third-quarter earnings results before the market opened today. For the second day in a row, stocks ended the day slightly lower after spending most of the trading session just below break-even. 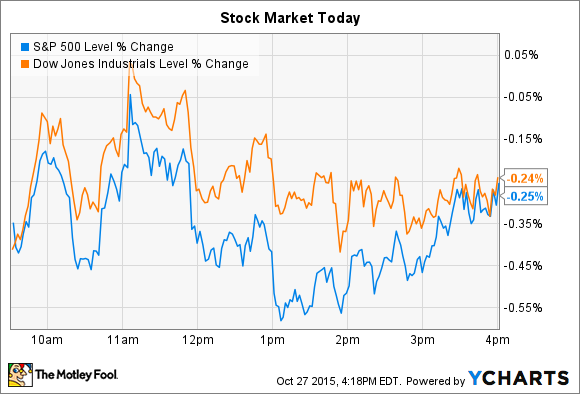 The S&P 500 (SNPINDEX:^GSPC) lost 0.25% while the Dow Jones Industrial Average (DJINDICES:^DJI) ended down 0.24%. The Federal Reserve began its two-day monetary policy meeting today and will announce its official statement at 2pm EST on Wednesday, Oct. 28. Most economists aren't looking for the Fed to raise interest rates this week. But it isn't clear whether such a hike will come at the next meeting in December, or sometime in 2016. Investors can expect some volatility around tomorrow's announcement as Wall Street digests the central bank's latest thinking on inflation, the economy, and the timing of its first interest rate hike in almost a decade. Meanwhile, quarterly reports announcements continue to pour in, driving large stock price swings in the process. Ford (NYSE:F) and Corning (NYSE:GLW) were two of the biggest individual movers in the market today after they posted earnings results and provided shareholders with updated business outlooks. Ford's stock slipped 5.2% despite announcing results that set company records across several key operating metrics. The headline numbers didn't quite match Wall Street's projections, but that might simply be because analysts were using too low of a tax rate in their models. In any case, net income more than doubled to $1.9 billion as Ford logged strong sales of profitable trucks and SUVs. Wholesale volume improved by 7% thanks mainly to a banner performance in the United States market. Full production availability of the F-150 truck helped push market share up by almost a full percentage point there as operating margin and overall profitability jumped. Ford logged a record $2.7 billion in North American profit, up from $1.4 billion a year ago. Those impressive results helped make up for a European market that's still struggling, having lost $182 million this quarter . Management reiterated their forecast for producing $9 billion in pre-tax profit this year. And with $7 billion banked through the first three quarters of 2015, that target seems well within reach. "We are delivering on a breakthrough year," CEO Mark Fields said in a press release discussing the operating results. Corning rose 5.4% and was among the best performing stocks in the S&P 500 today. The display materials giant posted third-quarter operating result this morning that included 15% lower earnings as sales shrunk by 11%. The company didn't have much better news for investors regarding the current quarter: Management forecast another drop in LCD volume and pricing over the holidays. "We expect global economic headwinds to persist in the fourth quarter," Chief Financial Officer Tony Tripeny said in a press release . Yet executives are encouraged that LCD glass pricing has been improving for over a year, and that Corning's new Gorilla Glass 4 product is meeting enthusiastic demand from early customers. As for long term trends, "consumers want larger flat panel displays and TV screens, which should drive overall glass volume growth," Tripeny said. The stock likely jumped in response to Corning's bold new capital allocation program, announced today, that outlines the spending of $20 billion over the next 4 fiscal years. Management plans to invest $10 billion into its business, with the rest being directed toward shareholders. Corning expects to boost its dividend by at least 10% in each of the next four years while at the same time spending heavily on stock buybacks. The company plans to fund this program mainly through cash flow, but also by reducing its cash on hand from the current $5 billion mark to just $2 billion.